Why Do English Bulldogs' Tongues Hang Out? If your English bulldog constantly has his tongue out, panting away, it's no surprise. He's a brachycephalic breed, a term meaning "short-head." While other dog breeds, such as the pug, Pekingese and boxer are also brachycephalic, many of the problems resulting from this head type disproportionately affect the English bulldog. That panting means the dog is working just to breathe. Also known as brachycephalic respiratory syndrome, this common problem affecting English bulldogs results from an elongated soft palate, stenotic nares - vetspeak for narrow nostrils - and everted laryngeal saccules. The latter means tissue in front of the dog's vocal cords obstructs air flow because it's pulled into the windpipe. According to Veterinary Partner.com., because of this condition bulldogs might have windpipes more suitable for the airflow required by a Yorkshire terrier than a dog of its size. Veterinary Partner notes that "it must be like breathing through a coffee stirrer." Besides constant panting, symptoms of brachycephalic airway syndrome include noisy breathing, shortness of breath, exercise intolerance, gagging while swallowing, fainting after exercise, snoring and sleep disturbances. Your dog often breathes with his mouth open. These problems usually become apparent at a young age, worsening in hot weather. It's possible for your vet to surgically correct stenotic nares, which can make your dog somewhat more comfortable and breathing easier. The same is true for elongated soft palate, in which some tissue can be surgically trimmed. In the bulldog, the soft palate, which separates the nasal passage from the mouth, is just too long for the dog's very short head. 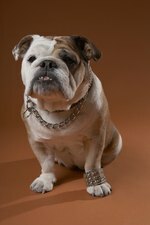 However, if your bulldog's windpipe is very narrow, also common in the breed, that creates a big risk for anesthetization. It's possible that putting him under for surgery is too dangerous. Because of his respiratory issues, it's important to never overtire your bulldog and keep him cool in hot and humid weather. Air-conditioned rooms are a must for your dog in the summertime. Don't let him bark too much, as this can cause throat swelling, making it harder for him to take in air. Excess panting can have the same effect. Avoid getting your dog overexcited. Calm is key for bulldog health. Because excess poundage adds to breathing problems, keep your bulldog at a healthy weight.